So my boys came home!! They got here Friday the 14th and stayed til the 23rd. While they were here , it went nonstop. There were plans and activities every day, and we all had so much fun. I loved that they were here, and am a bit surprised at how easliy things went. Mostly since hubby was home to help me, it really made things go quite smooth. We had three egg hunts, visits with relatives, and several playdates with my mom’s group (an awesome group of gals!! Love them all!!). With all the ups, there were also been some downs. But I will get to that. I also finally decided to make some things on my 30″ AJAL loom from www.dalooms.com. 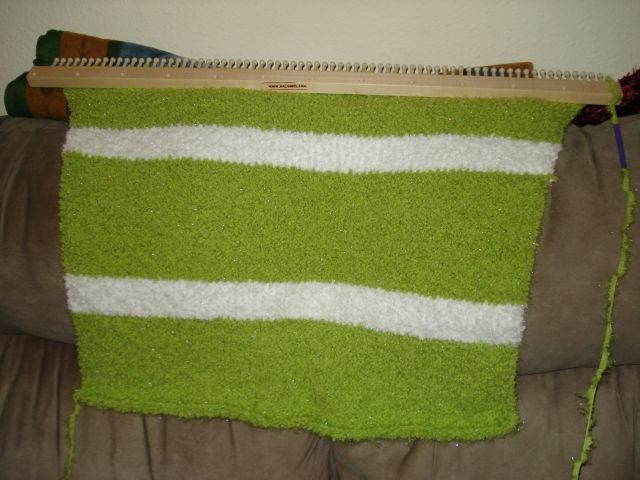 I have made two baby blankets (recieving size) on them, and working on a third. My cousin is having a baby in August (projected for the 14th), and we just found out it will be a girl. I was sure it was a girl from the moment they told us that they were pregnant. Silly, I know, but since I know I wanted a girl, they would be fortunate enough to have one. However, after this week, I don’t think another boy would be a disappointment–I will be happy with either when we finally do concieve (by the way, this month if we do, we will be due around New Year’s–how awesome would that be?!?). Anyway, here is a picture of one of the blankets, still being knitted. I will have to take pictures of the other ones, but the battery is charging…. One final note–I completed my first pattern!! My aunt had tried to teach me how to crochet, but it wasn’t working, and so I decided to do something about it. This last couple of days I worked on a solution for my loom, and it was a success!! I submitted my pattern and pictures of a swatch to the Loom Knitters Circle Magazine, and it was approved!! Now, onto the next step!! After it is published (if it works out that way), I will offer the pattern here. Now that I have made my first, I have SO MANY ideas!! Just have to get them on paper! Yay!! Wish me luck! Response to What are you Loom Knitting–thanks Karen! I’ve been behind in reading friend’s blogs, and just found this post. So I decided to respond!! *grins* This is in response to Karen Gielen’s blog post What are you Loom Knitting. Socks: top-down – yes, I have done several with my new sock/mitten looms! Love it!! Sweater – yes, and it turned out the wrong size. Cute, but way too small. I will try again! Teaching a child to knit – yes, my oldest SS and a friend’s child. Knitting on a loom – Yes, of course! That was fun! Anyone else? Ok, I have started writing this post at least three times in the last two weeks. And every time I start, I get distracted…guess I should just sit and focus. Yeah, right!! I think this time it will work since right now I am giving my new computer a test drive! So far, I love it! That’s one of the big things that happened in the last few weeks. It’s been nuts, really, but then again, who’s life isn’t? I have found that I am getting back into the old habit of taking on too much and not being able to finish anything in a timely manner. I should have finished my grandmother’s blanket by now, but new yarn and new looms (will get to that!!) have had me hooked on doing new things and new projects with new stitches and new designs never before attempted! After that realization, I sat down and pieced together what I did have done, and now I only have to finish the last panel and stitch it to the rest of the blanket. I feel a bit better about that, but still–need to get it done so I can take it out to her!! Her birthday was over a month ago!! As for the new looms–I am so excited that my DA looms finally came in about a week and a half ago!! It was right after hubby got home from his stay in Iowa (not an easy time while he was gone, but I had wonderful people to talk to!!). I had ordered a 30″ small gauge AJAL and the adult and child mitten loom sets with thumb looms in the fine gauge. Of course I started on them immediately, and have cranked out several socks–a first time for making them! The best anniversary present ever. To anyone who doesn’t have these looms: I highly recommend them. They are well worth the money and the wait, and I can’t wait to get more. The looms are very well made, and are just incredible. A total joy to work on. To see them, go to www.dalooms.com and check them out!! For those keeping up with the pregnancy mission, we are at a standstill right now. I am still waiting to see if my cycle will start, but so far, nothing. Thought it was about to, but now signs yet!! Already I have taken three pregnancy tests, but all have come back a BFN (big fat negative). Today I met with another doctor. This one is for pain managment, and #4 of the doctors that are trying to help get me preggers (GP, OB/GYN, endocrinologist, and now pain management). Why would I go to a pain management doctor? Simple. I have arthritis in my knees, hips, and left wrist. All quite painful, especially this time of year. Yes, I am only 28, but I have had it since I was 17. The OB didn’t want to write the prescription for pain meds, but I can’t continue taking the arthritis meds since it will harm the baby when we do get pg. After going back and forth with the other two docs, we all came to an agreement to start pain management. My new doc started me back on pain meds, and next week I start injections in my knees of steroids to see if it will help and lessen the necessity of the drugs. I am all for it–the scary part is that they will be knocking me out to give the shot since it will last from 5-10 minutes. OUCH. Thank goodness hubby has all week off next week and will be able to take me to do it. The down side? The boys (my stepsons) will be here for that week, and I am not going to be my best towards the end of the week. But they will be super busy–visiting family, several playdates, two egg hunts, and Easter. Anyway, hubby is positive we will be pregnant by summertime. I hope so…this is not an easy path. Last but not least, there is today. It is our two year wedding anniversary!! Mom and Dad are coming out here and we are all going to go to dinner. I am so excited!! It’s going to be a great day, and hubby has even taken half the day off. *grins* Can’t believe it has been two years. It seems longer, and yet shorter, at the same time. I will post pictures of all that I have talked about next time. Hopefully tomorrow. With the new computer, I am going to have to transfer the pics or get on the laptop. And on that note…off to finish cleaning the house, and then get ready for dinner!